This Victorian home was one of the first dwellings to stand in New Brookland, now West Columbia. New Brookland – also called just Brookland – was established in 1894. The town was developed as a resort village along the Congaree River for residents of Columbia. Shortly after he purchased his lot in the new community, Joseph Gunter built this home, considered an I-House with Queen Anne embellishments. An I-house is a style of farmhouse popular during the mid-nineteenth century which featured two stories that were each two rooms wide and one room deep with a central hallway. The style is called I-house due to its prevalence in states such as Indiana, Illinois, and Iowa. Gunter owned the home until 1912; that year, it was purchased by Onley Tillman “O.T.” Summers. O.T.’s father, Henry Jacob Summers, lived in the home from then until his death in 1944, and the house remained in the Summers family until 1983. The home appears much as it did when it was built over 120 years ago. The name New Brookland was changed to West Columbia in 1936. (Henry Jacob Summers House) The Gunter-Summers House, constructed in 1895 by Joseph M. Gunter, was one of the first houses built in New Brookland, incorporated in 1894, which later became West Columbia. The house is an excellent example of an I-House, embellished on its street façade with Queen Anne decorative elements. Its style is a symbol of adherence to an old form while embracing architectural elements of a later one of the Victorian era. The house is of frame construction with weatherboard siding and is supported by brick piers. 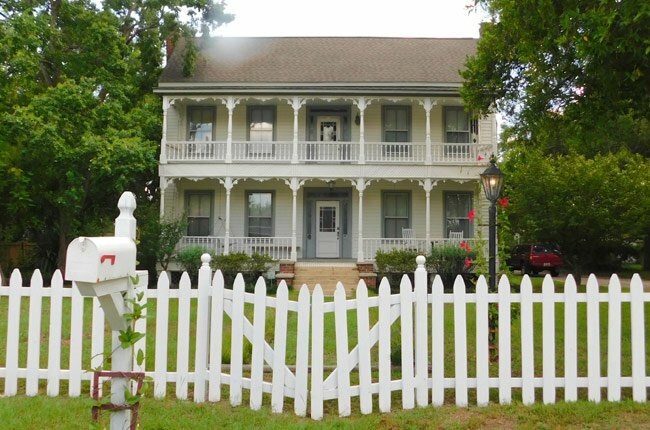 A two-tiered front porch with turned porch supports and balustrade, sawn brackets, and decorative trim extends across the façade. A right side rear ell, and enclosed hip roof porch (ca. 1984) with shed addition, and a wooden deck are to the rear of the house. The roofing material is pressed metal. Adding to the significance of the property are two turn-of-the-century outbuildings, a ca. 1900 barn and a ca. 1910 smokehouse with a braced overhanging front gable, rare in what is now an urban setting. The house was in the Summers family from 1912 to 1983.